Gold King makes sure that what it promises in the title, it delivers on the five reels that it uses. You have a Byzantine style king on the reels here, as one of the major symbols, a character that sports almost gold-like blonde beard, dressed in clothes with gold, red and black in it, and sporting a gold crown on his head that has tiny card suit decorations adorning it. The rest of the game has the same focus on the gold color, but without becoming obnoxious. You have piles of gold coins in the image from the background, barely visible through the reels. Besides the king, other symbols bring you images of his crown, a red rose set in gold, pendants and gold bars. You get just as many Royal cards as you get themed symbols unfortunately, so that’s a downside for the game, even though the look of these icons isn’t too bad. One of the most popular developer of games right now is Play’n GO, and if you’ve tried their games you know why. Features and graphics are always impressive in their games, especially the ones they launched in recent years. Ideally, you’d want to play their slots at Malta casinos, which are guaranteed to have RTP of over 96%. The company lets casinos choose the RTP for their games otherwise. 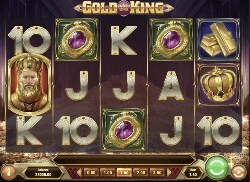 A game like Gold King is playable only if you have its lines active, and the wager needs to reflect that. You can spend as little as $0.20 and you can get the reels spinning. You can also increase the amount up to $100 if you want to. For that kind of range, spending between $0.01 and $5 per line is possible. It’s not a very difficult game to figure out, but a game from Play’n GO uses different betting options, listing values at the bottom, five at a time, and allowing you to pick the preferred one. The slot sports 20 lines on 5 reels. A Red Rose, shown here almost like it’s set in gold, will serve as a trigger for one of the major features that the slot delivers. The best possible situation is when you have five Red Rose Wilds on all positions of an active line, since that grants you a payout of 2,500x. If it doesn’t form a combination, it will still be useful often, as it acts as a substitute for any symbol that’s not a scatter. Super stacks of symbols are available every single round, one of the icons being chosen at random at the start to appear in that form. The super stack is 12 symbols high, so landing those symbols is quite likely. The Gold King is placed in the role of a scatter icon, which by appearing three times will give you 10 Super Spins. Land 1 to 3 additional scatters, to retrigger the feature with 2, 4 or 10 additional Super Spins. These Super Spins get stacked Red Rose wilds on the reels, while high-paying symbols can expand and low-paying symbols will come stacked. The game mentions in its paytable the highest amount that you can get from a single win, and it’s going to be $12,500, or 2,500x what the line bet was worth. Nothing is stopping you from filling the reels with high-paying symbols though, if your luck helps you out. Gold King is not going to be particularly interesting for players that want a great theme or graphics from their slots, but feature wise there isn’t much to complain about.